I am a Linux user, and a drupal developer too. 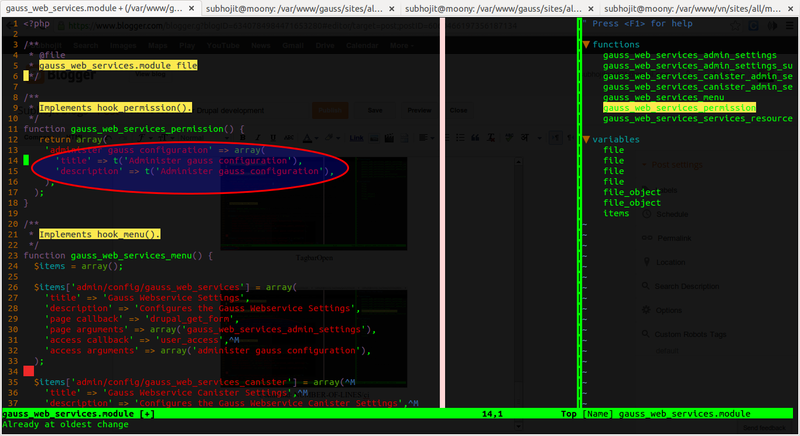 Its been months I am using vim for writing custom drupal modules. Before it was eclipse, eclipse was good but I was having issues because of two reasons. First, I was working on a big project with lots of custom modules and huge database. Loading a module in eclipse editor took several minutes and secondly, my computer is a bit old Intel Core 2 Duo processor and 2GB RAM and . I have always heard being vim as one of the most powerful editors, but I realized it that time when I switched to vim for writing or just reading the code of custom modules. Non Linux users can also download and use vim, especially Windows users. If drush version is 5.8 then it is okay. Otherwise you need to upgrade drush. The first command will dowload the vimrc project. The second commad will show you the options for installing vim plugins. This will install certain vim plugins that will turn your simple vim to cooool vim. Absolutely ready for writing custom module. 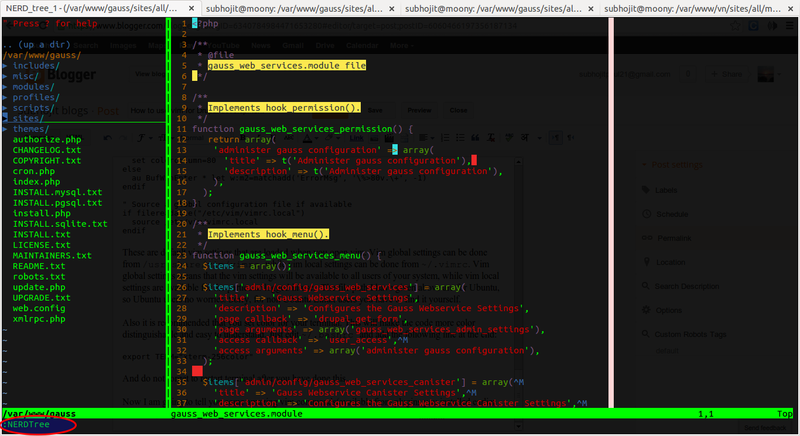 But you also need to configure certain vim settings so as to make it more developer friendly. I am providing my vim settings. Beginners can copy the settings, advanced users who knows tweaks and tricks of vim settings can make changes as they desire. 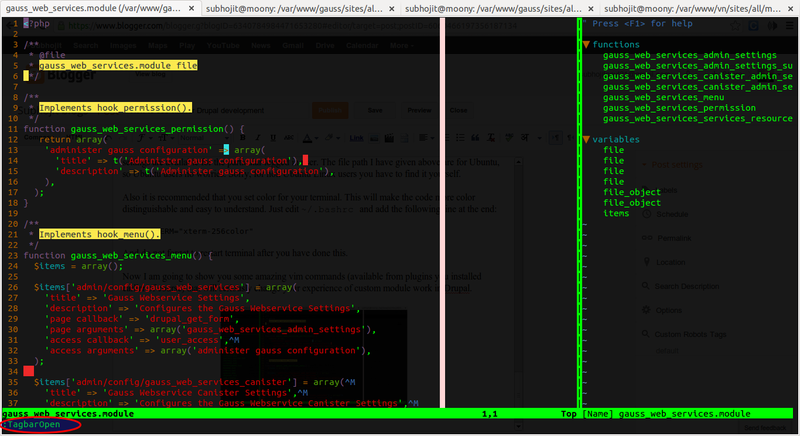 These are default vim settings that are loaded when you open vim. Vim global settings can be done from /usr/share/vim/vimrc while vim local settings can be done from ~/.vimrc. Vim global settings means that the vim settings will be available to all users of your system, while vim local settings are available for the particular logged in user. The file path I have given above are for Ubuntu, so Ubuntu users no worries. Sorry, for non Ubuntu Linux users you have to find it yourself. And do not forget to restart terminal after you have done this. Now I am going to show you some amazing vim commands (available from plugins you installed earlier of course) that will seriously change your experience of custom module work in Drupal. The most wonderful thing I like about this is, it will automatically identify the core version from the module's info file. Suppose you are working on a 6.x core version module then it will show the documenation of the 6.x version. Cooollll, Right? See a collection of vim plugins and settings for Drupal development in Use Vim as IDE for Drupal development, also see them in action. Excellent tips for drupal development. Will implement next time. Thanks for sharing. I have visited this blog second time today and read carefully. It's really helpful tips for me. Thanks for sharing. I am also Drupal Developer in CMMI Level3 company. Thanks. Deciding upon a content management system is highly vital to your success I now only use Drupal. Because As I researched and found out the most popular universities in the US use Durpal, I picked Drupal For hosting I like Pantheon with features like Drush integrations What content management system do you like? Thanks for sharing your settings with us. This is the great sharing for drupal developers. I also copied them and apply them soon. Good tips..i found helpful information about plugins in your blog. One of the more amazing blogs I’ve seen. Thanks so much for keeping the internet stylish for a change. You have got style, classification, bravado. I mean it. Please keep it up because without the internet is definitely losing in intelligence. This awesome and useful weblog....Thanks for this post, Thanks for publishing this useful weblog...well done. I am extremely upbeat to you to your time to impart this superb post! Much appreciated a decent alternative to impart this website to us. VIM plugin is suitable for make the possible features in Drupal website development.This blog is really helpful to how to use the VIM plugin in drupal platform.